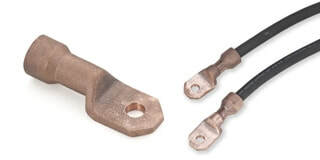 We offer a range of cables and connectors to allow you to outfit your magnetic bench or electromagnetic current generator to suit your specific parts and process. Whether you are testing a large investment casting or doing mag particle inspection in a difficult to reach location, these heavy-duty cables and connectors will help you set-up your Magnaflux machine just the way you need. Rubber-covered flexible cables are available in standard lengths of 15 ft / 4.57 m and 20 ft / 6.09 m with a choice of either end or lug connectors. Custom cables and replacement connectors are also available. 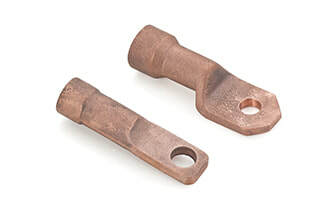 Connectors for attaching 4/0 cables to Magnaflux magnetizing equipment, including wet benches, power packs, mobile units.